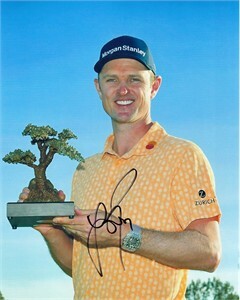 8x10 photo of Justin Rose holding the 2019 PGA Tour Farmers Insurance Open trophy (his 10th PGA Tour victory, setting a new record for English golfers), autographed in black Sharpie. Obtained in person at the tournament. With certificate of authenticity from AutographsForSale.com. ONLY 2 AVAILABLE FOR SALE.